Old timers likely remember stopping at a Howard Johnson’s restaurant for fried clam rolls and maybe ice cream. Then roadies who liked old-fashioned-style meals stopped at Cracker Barrels. More recently, Panera (still known in Missouri as the St. Louis Bread Co.) which popped up first in shopping neighborhoods, and then near highways, has become a popular, off-ramp food break. What they had in common was a good, reliable meal that wasn’t fast food. 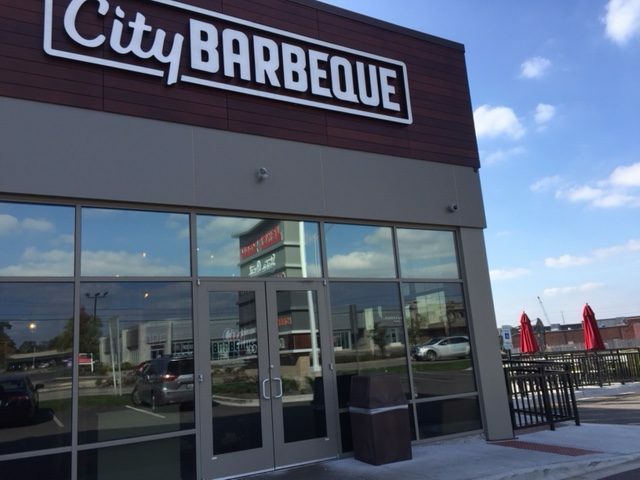 Now, City Barbeque, a Columbus, OH-based eat-in, take-out restaurant chain is poised to become the next are-we-there-yet rest stop. 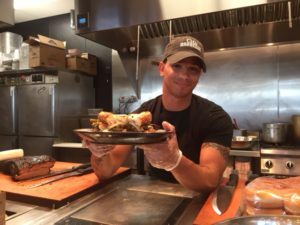 Their exceptional brisket and corn muffins, yummy banana pudding and sauces good enough to want to take home make City Barbeque restaurants a go-to place in the towns where they have been recently taken root. With a simple (not gourmet) mac and cheese on the menu to suit youngsters, they also appeal to families. 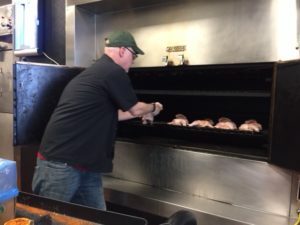 On recent visits to their two newest places in Chicago’s northern suburbs, Deerfield and Vernon Hills, I learned that the meats (including chicken) were smoked on site. Explaining that besides taking care of walk-in customers he had two catering orders, including a wedding, Wardrop boasted that even though it would be easier to make some items ahead, everything was made fresh that day. “That’s how we do things,” he said. While checking out both new suburban locations I realized they were on main roads that had exits from I 294. Vernon Hill’s City Barbeque was less than a mile west of the toll road at IL Hwy 60 and Milwaukee Avenue and the Deerfield location was a mile east of an exit on Lake Cook Road at Waukegan Road. BTW, even though they have several locations, the restaurants all have something in their décor that specifically relates to the area. In Deerfield, there is the town’s cute but infamous “no kissing” sign that had gone up by the train station to move cars along and there are two seats from Wrigley Field, one signed by Cubs Golden Glove catcher Randy Hundly. Visit City Barbeque to find out where the restaurants are and if one is on a road near your next driving trip. There are more than 45 locations across Georgia, Illinois, Indiana, Kentucky, North Carolina and Ohio.